Sanuarach Mine is a silver mine located in the small stead of Karthwasten. 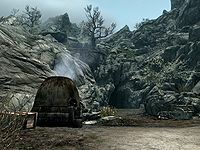 The property in the town and both mines are owned by Ainethach but a brutish mercenary named Atar is attempting to force Ainethech to sell the properties to the Silver-Blood family in Markarth. Seven silver ore veins can be found inside the mine and can be mined regardless of whether or not you are completing the related side quest. Sanuarach Mine: End the dispute over Sanuarach Mine. The entrance to the mine is in the village of Karthwasten. There is a smelter and a cart containing three pieces of silver ore opposite. When you first visit the village you will find the residents squaring off against the mercenaries in front of the mine. On subsequent visits there will be a guard in front of the entrance to the mine. Upon entering there is a ramp leading down to a junction, on your left are two small shelving units holding three iron helmets, two iron gauntlets, two iron boots, and a set of iron armor. Take the eastern path to the right and staying on the bottom level, follow the path and you will find a silver ore vein on the floor. Still in the eastern path, but now follow it up a wooden ramp to find two silver ore veins on your left, on the wall next to each other. Another wooden ramp takes you up to three more silver ore veins, again on the left wall next to each other. The western path opens out into a cavern with a large wooden structure, in front of this is a low table with two long bows and a quiver of iron arrows and two archery targets. On the left is a wooden ramp leading up to an eating area with two tables holding foodstuffs, the one on the left has a garlic sample and a further two garlic braids, two dried elves ears and a sample of dried frost mirriam hanging over it. The second has four bottles of Nord mead and a charred skeever hide. Another double wooden ramp leads up to the top and the final silver ore vein on the right hand wall. If you haven't completed the Sanuarach Mine quest, one Silver-Blood mercenary will patrol the right hand path, one will patrol from the junction to the cavern in the left hand path, while a third mercenary and Atar will be in the cavern. This page was last modified on 8 January 2016, at 04:57.